During ORA’s this year annual real estate advisory meeting in February, participants pointed out that most newly built or renovated apartment complexes and/or condos are providing various amenities for pets such as a designated Pet Walking/Potty Area , a Dog Grooming facility, etc. The discussions hinted a growing need for pet friendly buildings. 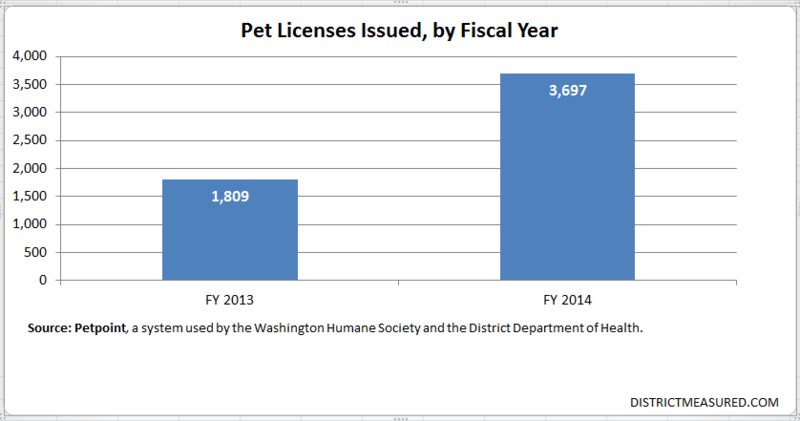 We decided to take a quick look at the District’s pet license data and the corresponding revenues from license fees to see if there is any growing trend. For the purpose of our analysis, we decided to stick to the last two years since data in Petpoint was made available as of the beginning of fiscal year 2013. We compared the above data with the corresponding revenue data from the District’s System of Accounting and Reporting (SOAR), and we found it mirroring the trend we see above. We will expand on our analysis as more data becomes available in Petpoint and see if the District’s changing demographics is contributing to this trend. In the meantime, we would like to hear what current and future pet owners would say about this. < Previous The District’s birth rate was 6th highest in the Nation. For adult-aged women, births tend to occur later in life compared to women in the Nation. High housing costs could be a factor.